Thurs, Jan 21 at 8:30pm. $25 Adv/ $30 Door. On Thursday January 21, three of Vancouver's most exciting bands will be rockin' out in order to raise money to build a school for the Afretech Aid Society and the Tujifunze Project. Tujifunze, which is Swahili for learning, is an organization in Tanzania, Africa dedicated to providing basic education to the youngest and most vulnerable children in Mwanza, Tanzania. Event organizer Susan Bibbings travelled to Mwanza after assisting Tujifunze for three years from her home base in Canada. Bibbings discovered that the school which serviced more than 60 children was a 12 x 12 foot concrete room located next to a dilapidated butcher's shop. The school lacked supplies and provided students with inadequate books. "We're in the business of getting as many children as possible under the shelter of this giant book," explains Bibbings. "We hope to build the school roof in the shape of a giant book," she adds. Hot Lucy (www.hotlucy.ca) is Vancouver's newest high-energy group. The band will be playing high octane traditional and modern blues with their signature "blues-done dirty" sound that's sure to set the dance floor on fire. Montgomery / Dupray 'No Quarter' features Rob Montgomery on guitar and Alita Dupray on vocals. Dupray's stunning jazz vocals transforms into a powerhouse of rock and blues as the band covers the best of Led Zeppelin, Cream, The Rolling Stones and more. Indie chart topping 22nd Century's (www.myspace.com/22ndcentury) hard punching and sometimes comical style is a mixture of Ramones power punk with a healthy dose of 1990's grunge. The group's debut CD produced by legendary music producer John Webster (Aerosmith, Cher and The Cult) garnered an honorable mention in Billboard's 2009 song writing contest. Proceeds from this event will go to Afretech Aid Society for the Tujifunze Build a School Project. Yale VIP Passes not accepted. Lately I've received several emails from people asking about setting up projects using more than one file. Having come from an Eclipse background, I found it really intuitive but realized there are not many good tutorials on how this works specifically with Flex Builder or Flash Builder from Adobe. Here is a quick start on how to get your project up and running. Start a new project and name it. A Flash Builder/Flex Builder project may contain several components, ActionScript files, classes, packages and other assets. The first step is to identify your project's entry point and then reference other files. Line 1 is the XML processing declaration and line two contains the root component of the application. This particular application is a Windowed Application (Adobe AIR). 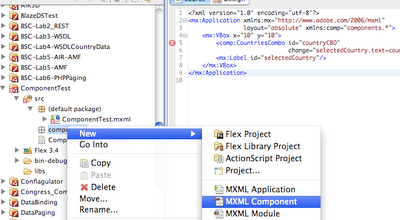 The xmlns:mx="http://www.adobe.com/2006/mxml" line tells the compiler to use a specific Flex SDK, in this case the Flex 3.4 SDK. The namespace declaration below on line 3 (xmlns:components="components. 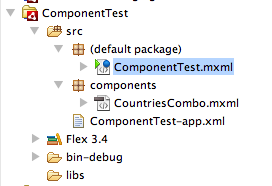 *") declares that the project may use any or all of the components in the Package named "components". Note that at this point in your application, the Package has not yet been created so your project will throw an error (correct behavior). Line 5 of the code is where the a specific component is referenced. Because this component is namespace qualified with the same namespace prefix given to the "components" Package, the component MUST exist within that package. The specific component named here is CountriesCombo. The declaration comp:CountriesCombo tells the compiler to create an instance of that component at runtime. Creating a new Package is really easy. In Flash Builder 4, highlight the src folder and right click (PC) or Command-Click (OS X) the folder and a context menu will appear. 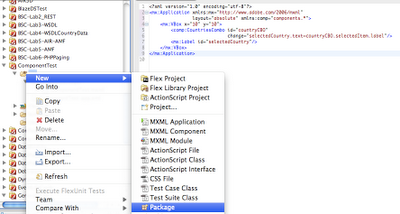 Select "New -> Package" as shown and when the dialog pops up, give the Package the name "components". Remembers that these are case sensitive. Now that you have a Package created, it is time to add your component. It is just as easy. Right-click (PC) or Command-Click (OS X) on the newly created package and select "New -> MXML Component" from the Menu as shown below. Note that all red X's are gone. If your project still does not work, try cleaning it "Project -> Clean" from the top menu. If you have added a component to your project that is not being recognized, you may have to manually refresh the package Explorer view. Do this by right clicking on the root folder of the project (or even just the src folder) and hit "refresh".